It's more than just a meal calendar! CareCalendar is the original free website to organize meals and other help for families in need during a time of illness or life changing event, such as the birth of a baby or death of a family member. Simply list the help that is needed and family and friends can sign up to fill those needs. Like an online signup sheet, only better. CareCalendar can also be used for long term situations, including homebound and caregiver respite care needs as well as supporting military families during a deployment. Want to take a meal or give a ride? See what help is needed and then sign up to take a meal, give a ride, run errands, do housework or yardwork and any other help that your loved one needs. Get email reminders about needs that you signed up to fill. Get maps and driving directions: Know how to get to the recipients location, turn by turn. Access when convenient: CareCalendar is available around the clock. As long as you have access to the Internet, you can get to CareCalendar. No need to worry about interrupting the recipient's or coordinator's day when you can easily look it up for yourself. Coordinate meal sign up, and other needed assistance, online -- without the frustration of playing phone tag and email overload. The volunteer helpers can see the needs and sign-up for items that fit their schedule. Reduce the amount of time needed to coordinate the effort: Volunteer Helpers can access the CareCalendar when it's convenient for them. No need for phone tag or explaining the needs over and over again. Helpers can see what is needed and when and sign themselves up to fill the need. Create a free personalized calendar: CareCalendar web pages are created specifically for each recipient with personalized features and information. All personal CareCalendar sites are password protected for privacy. When a family member is sick or recovering, the entire family does not have to place life on hold. Asking for help can be very difficult for some people. CareCalendar makes it easy to let the needs be known in a way that removes the feelings of burdening others. Helpers can see what is needed and sign-up for what they would like to help with. Provide status updates: Has the situation improved? Worsened? No change? Friends want to know the current situation, but don't want to be a burden by constantly calling. Have you ever had to give the same update to several people? It can be an emotionally draining task during an already stressful time. Now, whenever you have an update, you can "blog" it. Enter updates as often as you like and concerned friends will know how to find out the latest news. Upload photos: Great for showing off the newborn baby or letting family and friends see what is happening when they can't be there in person. For larger groups, like a church or civic organization, a photo can help people recognize the recipient. Password protected: Each CareCalendar web site is password protected for privacy and can only be viewed by entering the correct information. Sensitive needs can be set up to allow only certain helpers the ability to sign-up for them. Communicate easily: Contact with all registered Helpers can be done at once via email. Also, phone numbers and email addresses for each registered Helper available when you need them. Include others: Think larger than just your group. It shouldn't be just about what your group can do, it should be about what the recipient needs! Family and friends like to help when there is a need. People from other groups may want to take them a meal or help in other ways and they shouldn't feel excluded and unappreciated because they are not in YOUR group. With CareCalendar, little or no additional effort is required to include others while filling the needs of the recipient, which is what it's all about - Bringing communities together to care for loved ones. Enjoy flexibility: For those people that want to help but don't have access to the Internet, they can still phone you and you can enter their information on CareCalendar. When on the go, you can print out a paper copy of the calendar to take with you and use as a sign-up sheet. Easily enter the new signups the next time you are online. * What is a "Help Team"? CareCalendar is a donor supported ministry of the Bortel family and is provided free of charge for individuals and non-profit organizations when used to provide help for families and individuals during a time of need. Please contact us for approval before using CareCalendar for any other purpose. Advertising and sponsorship opportunities are available. This is a great way for your business or organization to get local exposure - especially churches, restaurants, midwifes, birth centers, hospitals, civic organizations and more. See our sponsor page for more details. 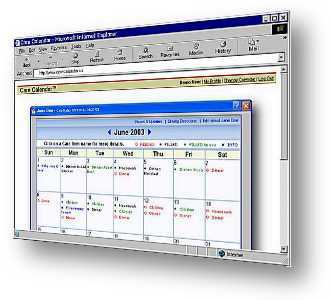 CareCalendar was the best tool imaginable for keeping all of our help organized after the quints were brought home. Technology is making it easier for churches and other groups to meet the needs of families dealing with illness or the birth of a child. I was diagnosed with Breast Cancer and had surgery and chemo treatments. Care Calendar allowed my church, neighbors and friends to all get involved in helping us with meals, childcare, and mowing our lawn. Thank you for this invaluable tool that is touching many families. I love CareCalendar! It has made it so much easier to help our friends in need. I was diagnosed with Brain Cancer and had surgery to remove the tumor. A friend set up a CareCalendar where friends have gone to sign up to drive me to daily doctor's treatments (doctor ordered me not to drive) and to bring dinners to the house several days a week. It has been a life-saver by taking all of that stress off of me and organizing the army of people that want to help. This is the most awesome tool to help someone that I have ever seen! I cannot begin to express what an amazing tool this is! No playing telephone tag, no sending separate reminders each day so that nothing slips a volunteer's mind, etc. Finally, what an awesome place to direct all of the well-meaning folks who respond with "let me know what I can do"! All groups - whether it be friends from work, church, neighbors, etc. - can all work from the same calendar so that there isn't overlap or gaps not filled. After [a previous time consuming] experience, I was reluctant to coordinate such a army of volunteers again, but using Care Calendar has been an awesome blessing! Thank you so much for making this service available! Meals were provided for over 140 days and CareCalendar made it all possible. It gave us organization and efficiency ... Thanks for making such a great ministry tool! We recently discovered Care Calendar and we love it. It makes coordinating meals so quick and easy. Thank you so much for this free service. Thank you so much for [CareCalendar]. It is so exciting to see the results that we have gotten from it. "...fantastic, unique, innovative, effective, Christ-birthed idea!" I am all about doing things 'on the fly' when I get a chance and CareCalendar made it much easier to see at a glance what was already taken, what remained, and what fit in with our schedule." Our church started using Care Calendar a little over a year ago. This has been the best time saver for those of us that are coordinating meals for families. The best part is that the family can see the calendar too and there are usually no duplicates on meals! This is incredible. Thank you so very much for making it so easy to help a friend/co-worker in need. What a blessing! [CareCalendar] has made helping others an absolute pleasure...the coordinator's job is now so simple! After having my baby, meals were brought to us every day for over two weeks. We appreciate you making this service available so we could put our time and energy into caring for our growing family. Before CareCalendar, a family would sometimes get several meals one day, and then several days that nobody would bring a meal. Now, after using CareCalendar for meal sign ups, we are much more organized and the receiving families are better cared for. We created a meal schedule for a sick friend using Care Calendar. Online meal sign up was easy and our friends could look on the web site to see who was scheduled to bring them a meal, and what was on the menu. This is a great website for helping others!